Back in the middle of last year, Humble Bundle released the "Humble Narrative Bundle", a bundle with visual novels, point 'n' click adventures and RPGs such as 2064: Read Only Memories, Cibele, Broken Age, 80 Days, Sorcery! Parts 1 and 2 and, last but not least, Her Story. As you can see, I've only reviewed one game out of this bundle so far (probably because I already played Broken Age prior to the bundle being released) and Her Story will make it two! So that's four more games in the bundle left to review (if you consider Sorcery! Parts 1 and 2 as one game). I did finish 80 Days as well so a review for that game should be on its way soon :). As my loyal readers and friends would know, I'm a big fan of adventure games and generally any games with a strong narrative or a narrative focus. Consequently, acquiring the "Humble Narrative Bundle" was a no-brainer. Also, since games with FMV were all the rage during my gaming hey-day (i.e. the early 1990s) I couldn't say no to giving Her Story a try. So how does Her Story actually work? Well it's probably classed more as an "experience" rather than a game, so it is similar to "games" like Gone Home or Dear Esther, except unlike those games it's not a walking simulator and unlike Dear Esther, the plot is not nearly as hard to piece together. 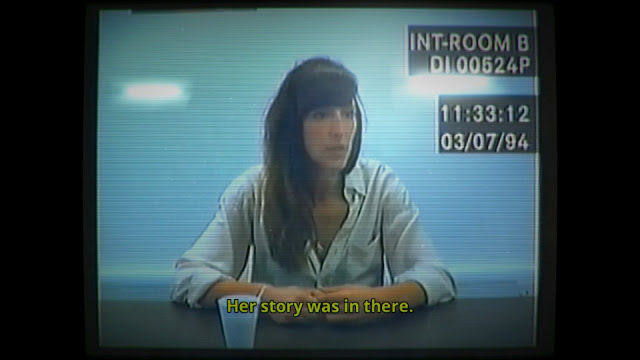 In Her Story you're a person using an old police computer terminal which you can use to view many video clips; these videos contain interviews related to a murder case during the 1990s. You're able to search the database for videos based on keywords. For example, if you type the word "coffee" into the search field, it will bring up all videos where the suspect utters the word "coffee". Neat, huh? This is basically the way the game works, by you watching videos, picking up any words during the interview that you think are important and then using those words as keywords in the search for more videos. By watching more videos you'll learn more about the story and piece together what actually happened (as well as the identity of the woman that was interviewed). I'm actually a big fan of the oldschool method of typing words on a keyboard in order to advance the plot; it actually reminds me of the Sierra text parser adventure games of old where in order to progress conversations, you actually had to be concentrating since you'd only learn new morsels of information if you happen to mention the correct word. The point 'n' click adventures released by Sierra in later years, while still awesome, just weren't the same when it came to conversations; it was simply a matter of exploring the conversation trees to ensure you asked every single question possible and as a result conversations didn't feel as dynamic or realistic. As already mentioned, I love FMV games although this time, it actually makes sense to use them since it's a game about watching old videos captured and stored during the 1990s. I also happen to love murder mysteries and as I've mentioned in previous posts, I think adventure games are the perfect place to explore them. The difference with Her Story is that it's entirely possible you'll get to the end of the game still not quite knowing what actually happened which some players might find frustrating but for others it would just encourage them to play the videos again to see what they missed. There are a couple of big plot twists while you play the game so it's well worth the admission fee in my opinion. The game has a bunch of Steam achievements to hunt for as well as trading cards to generate. I really didn't find too much to fault with this game although I do offer you a warning: Don't press the "Delete Session Data" button! If you do, you can say goodbye to all your search results (i.e. videos), which you means you'll have to start again. You've been warned! If you like FMV games and murder mysteries, what are you waiting for? Her Story ticks all the right boxes. The only criticism I could make is that the game might not be enough of a traditional game to some since it's more of an exercise in exploring videos on an old PC at your own pace. However, I still enjoyed the game and appreciated its strong narrative as well as the nostalgia factor (Win 95 represent!). Is the game worth $5.99 USD? : Yes. The game is about $8 AUD which means a good few hours of FMV murder mystery for under $10. Worth it.